I have to be honest and admit I’ve only made this once, but it has got to be just about the easiest non-baked treat I’ve come across. A friend recently shared the original link on Facebook (you can follow Chocolate Goose on Facebook at http://www.facebook.com/chocolategoose?ref=hl\) and it looked so delicious I had to give it a go. It didn’t last very long either so it will definitely be made again, and again, and again…you get the picture ;). 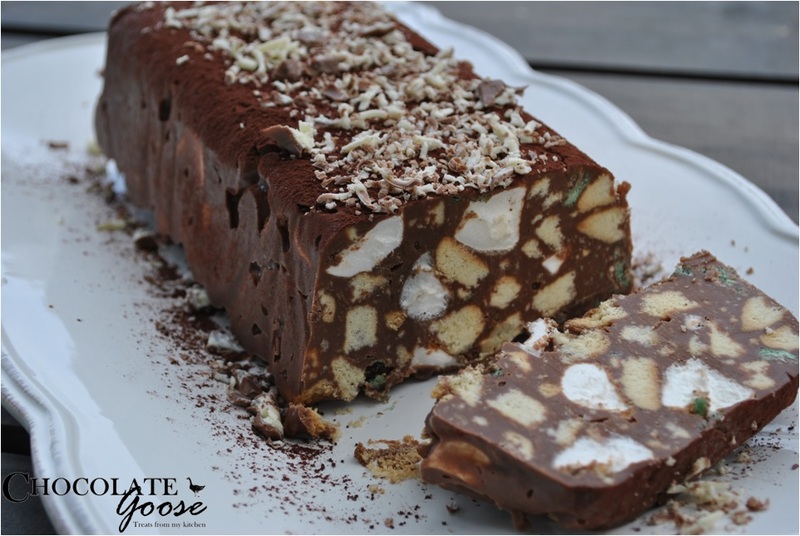 I also realise this has nothing to do with Easter, and although I was planning on doing another Easter themed treat, this log got the better of me so please just humour me – surely anything chocolatey at this time of year passes as an Easter treat? Well, I dare you to try it. It’s another one of those recipes where you can adapt the ingredients to suit your taste buds or pantry stocks and everyone will be begging for more. Although I must warn you, it is very rich, so a little goes a long way. https://www.facebook.com/thekatetin?fref=ts if you’d like to see it in all it’s former glory. The original recipe called for part of the Peppermint Crisp to be included in the log with the rest sprinkled over the top, but I personally think this may have overdone the peppermint flavour a little, so I halved the quantity required and put it all into the log, then grated Kinder chocolate over the top so play around with the ingredients as much or as little as you like. In a saucepan, combine the butter, milk chocolate and condensed milk over a low heat and stir until melted. In a separate bowl, break the biscuits into pieces and combine with the peppermint crisp chunks and chopped marshmallows. Line a standard size loaf tin with a sheet of baking paper and set aside. Combine the melted chocolate mixture with the biscuit mixture and stir until combined. Unmould and dust the cocoa powder over the top, using a fine mesh sieve. Sprinkle over the rest of the chopped/grated chocolate and cut into slices. TIP – you might want to remove it from the fridge a while before slicing as it becomes so hard, it can be difficult to cut – alternatively, once set, slice the full log and return to the fridge and then dust with cocoa and sprinkle with chocolate when ready to serve. Next postBest Chocolate Brownie – ever!